A pumpkin harvest you won’t soon forget! The day Evy slipped on her gardening boots and began planting seeds in the soft, black earth, she saw a feast waiting to sprout. Evy is so focused on watching her garden grow, that she misses all the silliness going on around her- pigs dancing, donkeys flying, and sheep having a picnic. But after nurturing her garden all summer and harvesting in the autumn- it’s Pumpkin Time! And what better way to celebrate than with a delicious feast for everyone. 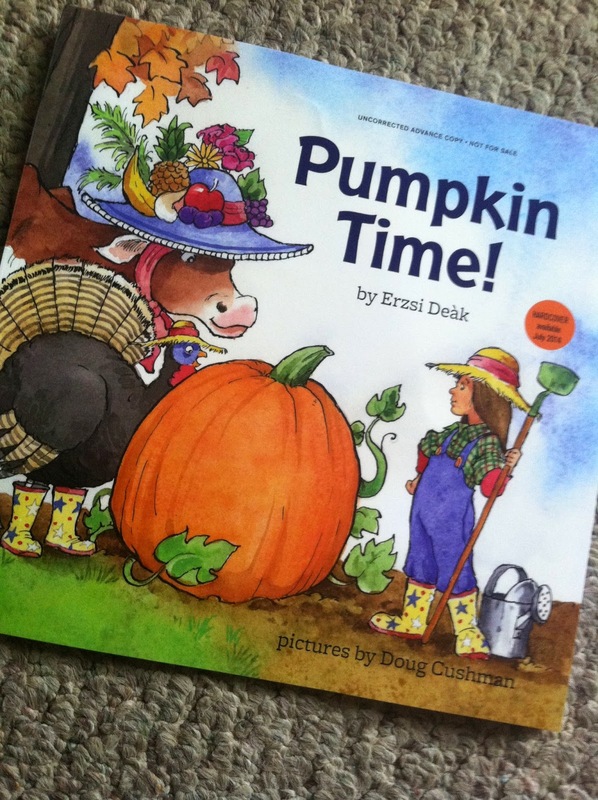 Gorgeously illustrated by New York Times and IndieBound bestselling illustrator, Doug Cushman, this charming picture book features pumpkin facts, delicious recipes that parents and children can share together, as well as a step-by-step walkthrough of Evy’s pumpkin growing process (in case you were too focused on all the silliness). Pumpkin Time captures the beauty and bounty of fall and harvest time, and encourages parents and kids to try their own hand at gardening. Erzsi Deák is the founder of Hen&Ink Literary Agency. This is her first picture book. She lives in the south of France. Visit Erzsi at www.erzsideak.com. Doug Cushman is the illustrator of numerous bestselling picture books and beginning reader books. He lives in the U.S. and France. Visit Doug at www.doug-cushman.com. Goddess is still a reluctant reader but she found this book quite easy and funny. What we loved about it most was the absurdity of it. When the book stated raining buckets; it was literally raining buckets. When the chickens flew the coop like feather dusters in the wind, pigs dancing around a May pole. It was just a funny book with fun pics to go along with it. Colorful, funny and mysteries, this book will have kids wondering what Evy was doing until the very last page when it is put to the interruption of the reader. Was Evy really just baking the biggest pie ever or was she just allowing the animals to be who they really are when no one is watching. The world will never know but the reader at least gets to see some silly animals and a very busy young farmer. I would enjoy reading The Princess Problem. I also like their board book Grandma Loves Me! I'd like to read The Book of Someday by Dianne Dixon. The Broken Spell looks interesting.